The product owner is the cornerstone of project success, responsible for defining the work that needs to be completed and prioritizing that work. He or she needs to know what the project is expected to deliver and why those elements are important - to customers, to the market, to the organization. The product owner must also act as an expert guide and provide valuable suggestions as the team carries out the project. He/she remains actively involved throughout the Project execution, Reviews and Reprioritization based on shifting needs and ongoing feedback. The changes in priorities and feature design should be properly communicated and explained to the team by the product owner. The PO’s entire focus is on ensuring that the work done by the team aligns with product vision and strategy. A product owner should be self-disciplined and avoid micromanaging the team's activities. He or she is assisted by the Scrum Master. Read more about the Product Owner’s role. The Scrum Master role has two distinct parts. First, he or she acts as the protector of the team, making sure that everyone on the project, especially the development team members, can focus on their work without any distractions. Some of those distractions may be directly associated with the work - for example, the product owner who oversteps the boundaries and starts to dictate the work approach to the team. The Scrum Master may need to protect the team from organizational disruptions or internal distractions - for example, arranging to replace problematic computers or providing a less noisy work area. Second, He or she will ensure that the product owner and development team stay within the Scrum framework. The Scrum Master is the expert on how Scrum works and how it should be applied. The Scrum Master can also coach the team members on how to use Scrum in the most effective manner. 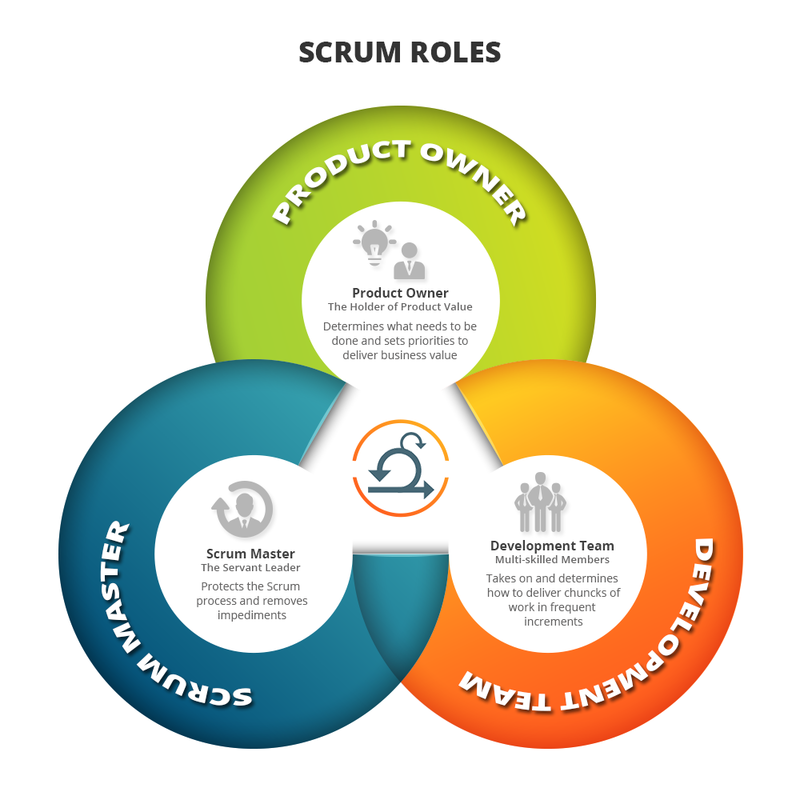 Read more about the Scrum Master’s role. A typical Scrum development team consists of five to nine skilled people and generally includes the typical functional roles required to complete the project. In software development, it means architects, testers, developers, and designers; but those titles are only relevant in establishing each individual's expertise. The team acts collectively to determine how to achieve its goals. The specific features it works on are determined by the priority established by the product owner. The work done by the team is guided by the Scrum process and monitored by the Scrum Master. Everything else is up to the team to manage. Each team member can take a feature from the prioritized sprint backlog, then decide individually how to execute the work. This level of autonomy is a cornerstone of Scrum. It encourages strong bonds between team members and helps create a positive working environment. While the idea of a team exists in Waterfall projects as well, in that environment the team is functionally managed by the project manager, rather than being self-managed. Read more about the Scrum Development Team’s role.